Egg Holders There are 7 products. 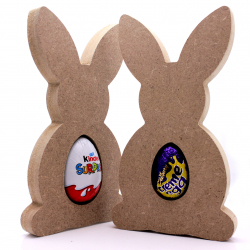 These 18mm thick MDF Easter Bunny shapes are cut from premium 18mm thick MDF using a rotary CNC Tool.The Bunnies are cut with either a hole for a Kinder Egg or for a Creme Egg. 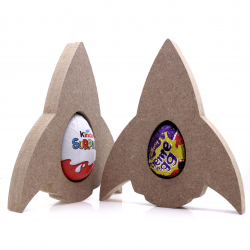 These 18mm thick MDF Rocket shapes are cut from premium 18mm thick MDF using a rotary CNC Tool.The Rockets are cut with either a hole for a Kinder Egg or for a Creme Egg. 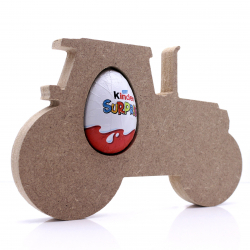 These 18mm thick MDF Tractor shapes are cut from premium 18mm thick MDF using a rotary CNC Tool.The Tractors are cut with either a hole for a Kinder Egg or for a Creme Egg. 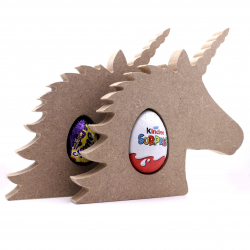 These 18mm thick MDF Unicorn shapes are cut from premium 18mm thick MDF using a rotary CNC Tool.The Unicorns are cut with either a hole for a Kinder Egg or for a Creme Egg. 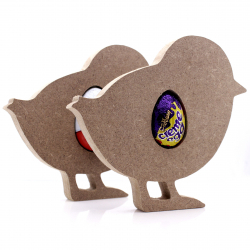 These 18mm thick MDF Easter Chick shapes are cut from premium 18mm thick MDF using a rotary CNC Tool. The chicks are cut with either a hole for a Kinder Egg or for a Creme Egg.They can also be cut without any holes. These 18mm thick MDF Football Shirts shapes are cut from premium 18mm thick MDF using a rotary CNC Tool. 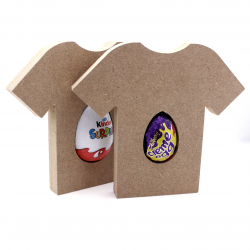 The T Shirts are cut with either a hole for a Kinder Egg or for a Creme Egg.They can also be cut without any holes. These 18mm thick MDF Tutu shapes are cut from premium 18mm thick MDF using a rotary CNC Tool. 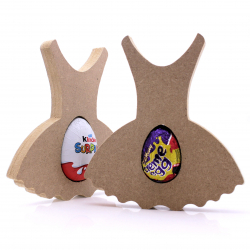 The tutus are cut with either a hole for a Kinder Egg or for a Creme Egg.They can also be cut without any holes.